Bosque del Cabo is primarily a nature lodge, and we have an amazing variety of wildlife living on, and moving through, our land reserve. 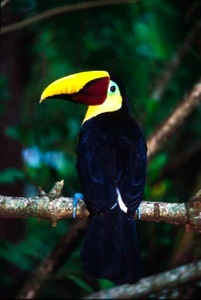 Bosque is one of the best places in Costa Rica, and even all of Central America, for seeing forests and wildlife. Bosque’s large rainforest compound beautifully showcases the rich biodiversity of the Osa Peninsula, which is considered to be one of the most important, thriving and vital biological regions of Central America. 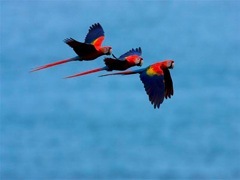 There are large populations of endangered animals such as the Scarlet Macaw and the Squirrel Monkey, as well as surprisingly diverse categories of endemic plants and animals, such as the Black-cheeked Ant Tanager, the Yellow-billed Cotinga and the Golfo Dulce Poison Dart Frog. Of course groups of Howler Monkeys, White-faced Monkeys, toucans, parrots, coatis, Agoutis, Collared Peccaries, Tyras and even tapirs are relatively easily spotted on the grounds of Bosque. The Osa is also home to 7 species wild cats and several of these species, such as the Puma, Jaguarundi and Ocelot, are seen from time-to-time by our guests. As other areas of the world, and even Costa Rica, are being deforested and developed, the Osa remains a stronghold of pristine forest settings surrounded by thriving marine habitats and rugged coastline. We at Bosque are trying to create an accessible and comfortable setting in which our guests can really take advantage of seeing the amazing flora and fauna of this very special part of the world. 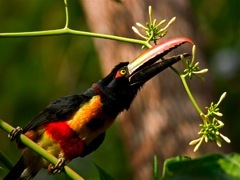 Bosque del Cabo is the place to go in Central America if you want to watch wildlife. Where else can you sit on your cliff side porch looking out over the Pacific while monkeys and scarlet macaws cavort right in front of you? The wildlife at Bosque are relatively unafraid of human observers making observation an easy and non-disruptive activity. There are plenty of rainforest lodges in Costa Rica. Few are set in such a spectacular setting where the forest primeval descends right to a wilderness coast. During the wet season thousands of olive ridley sea turtles nest along this section of coastline. All four kinds monkeys that live in Costa Rica, the white-faced capuchin, mantled howler, Central American spider and squirrel monkeys are easily seen. I have often seen all 4 species in a single morning’s walk at Bosque del Cabo. The 5 wild cat species found in Costa Rica have been recorded on and around Bosque including puma, jaguar, ocelots, margays and jagarundi. Tapir, white-lipped and collared peccary frequent the area. These animals are normally rare outside of national parks. Three-toed sloths are common around Bosque. However, sighting this cryptic animal is often difficult. The upper sections of Cecropia trees along the road are the best places for sloth spotting. But where ever you walk on Bosque you are certain to see wild life that is beautiful, interesting and accessible. call it home. Not to mention the myriad of reptiles, frogs, bats, plants, and insects that also live here. This is why I came to the Osa. scenery, great food and accommodations are generally enough to keep most guests coming back to a lodge or hotel….not me! I need animals: birds, frogs, snakes, colorful little beetles, cheeky monkeys, this is what a wildlife photographer needs to be happy and Bosque del Cabo was a paradise found. The most interesting thing about Bosque del Cabo is that it just keeps getting better. Because Phil and Kim continue to purchase and protect forest buffering the lodge, wildlife is more plentiful and easier to see than ever before. Their conservation and low impact philosophy has also motivated other establishments to become better stewards of this amazing place. I am completing a coffee table book on the Osa which highlights the natural wonders found here and have to admit that probably 50 % of the pictures were photographed on the grounds of Bosque del Cabo. 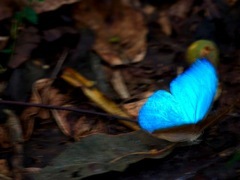 This is why for the last 6 years I have conducted my Costa Rica photo workshop here. The complete package of rustic elegance, great food, top notch guides, adventure and wildlife, make Bosque Del Cabo one of my favorite places to visit….can you tell I love it? Thank you Phil and Kim for what you have done, and for treating me like family and my workshop participants like honored guests! "Roy Toft; professional wildlife photographer, published in National Geographic, Audubon, Wildlife Photographer, Coastal Living, etc." All photos on this page courtesy and copyright of Roy Toft. I have now been the biologist in residence at Bosque del Cabo since 2001. Over that period of time it has never failed to amaze me how incredibly rich the biodiversity of this area is. 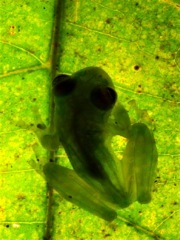 Bosque del Cabo’s already extensive species inventories are constantly accumulating new records. For this reason I would recommend Bosque del Cabo to anyone having an interest, casual or professional, in natural history. Here you are surrounded by a wealth of flora and fauna, most of which requires little effort on behalf of the visitor to observe. 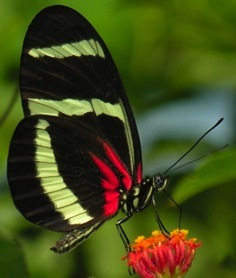 There are so many mammal, bird and butterfly species in the grounds. 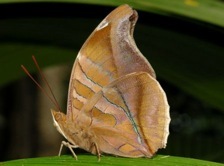 More species of butterfly have been recorded in the grounds of Bosque del Cabo than in nearby Corcovado National Park. Mammals, despite their size, are normally shy and retiring creatures but at Bosque a large number of species can be seen without too much effort. The Osa Peninsula is home to almost twice the number of species of bat than the whole of the United States. For bird watchers, every day will bring new sightings. Most people can’t help but enjoy the colours and form of frogs. Once again you will not be disappointed, there are large amphibian breeding colonies in Bosque’s two ponds. Bosque del Cabo’s trail system gives ample opportunity to hike through a wide variety of habitats; primary and secondary forest, open gardens and coastal areas. I enjoy spending a great deal of my time walking the trails, recording and photographing the wildlife around me. What adds to the whole experience is that the hotel itself is so welcoming and restful between activities. The cuisine is exceptional and the staff so helpful and friendly. I know that I have been fortunate to have had access to such a wonderful study site. I cannot thank enough my gracious hosts, Phil and Kim for their hospitality over the years. I can only suggest that anyone wishing to experience a tropical rainforest could not find a better location than Bosque del Cabo. Dr. Alwyn Gentry (the late, world-renowned botanist and conservationist) described the Osa Peninsula as "…outstanding in the context of the Neotropics or the world in general for that matter in how closely it approximates the classical cathedral-like rainforests with very large trees and a very open understory." 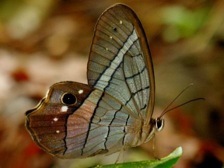 The tranquil forests of the Osa support a rich array of wildlife. 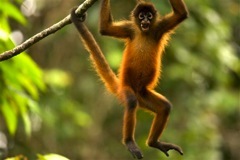 Bosque del Cabo is a superb spot for monkey watching, perhaps the best in Central America. There are four different species of non-human primates, or monkeys, that live in the Osa's forests: they are the white-faced capuchin (Cebus capucinus), mantled howler (Alouatta palliata), central american spider (Ateles geoffroyi), and squirrel (Saimiri oerstedii). Generally, you will find howler, squirrel and capuchin monkeys in primary and secondary forests while the largest Osa monkeys, the spider monkeys, spend most of their time in primary forest. 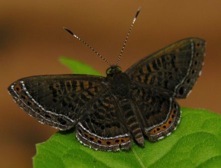 All four species are abundant at Bosque and relatively habituated to human observers. You can often sit on the porch of your cabin and watch monkeys behaving in a completely natural manner. Many other large, spectacular mammals can also be spotted on the Bosque del Cabo property and surrounding areas. These include the tayra (Eira barbara) a very large bi-colored weasel, white-nosed coati (Nasua narica), collared ant-eater (Tamandua mexicana), agoutis (Dasyprocta punctata) and pacas (Agouti paca). Pumas (Puma concolor) have been seen from time to time within a short walk of Bosque, as have jaguars (Panthera onca). Three-toed sloths (Bradypus variegatus) are quite common around Bosque, however, sighting this visually elusive, strikingly slow-moving and muscular animal is often difficult. If you are intent on seeing a sloth, our best recommendation is that you scour the upper sections of trees, especially Cecropia trees along the road.